Investors and analysts think the company has finally put together a better deal. SunEdison shares jumped more than 14 percent today after the company revised the terms of its acquisition of residential installer Vivint Solar. 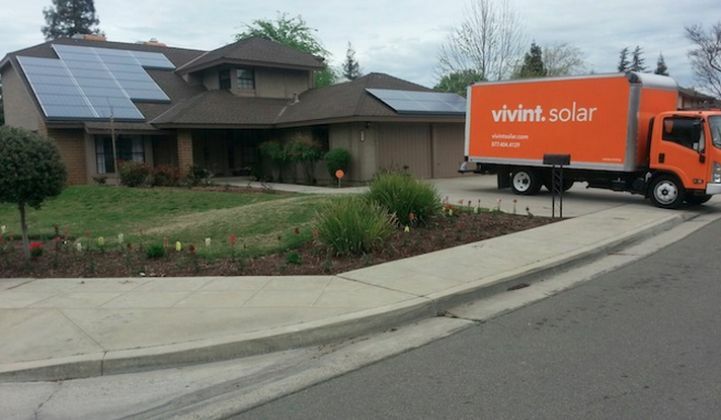 In July, SunEdison unveiled a $2.2 billion plan to acquire Vivint in cash, stock and convertible notes. Investors were not thrilled with the terms of the deal, however, and SunEdison's stock declined precipitously over the following months. Under the new agreement, SunEdison's YieldCo, TerraForm Power, will pay $799 million in cash for Vivint's residential portfolio -- down from the original $922 million in cash. Vivint Solar shareholders have an option to purchase SunEdison's common stock for an additional $0.75 per share. The private equity firm Blackstone is also offering a credit facility worth $250 million to back SunEdison's growth plans. "Given the recent market volatility, we believe the modified agreement is in the best interest of all parties. In addition, we are also delighted to add the Blackstone team as a key new stakeholder and partner," said SunEdison CEO Ahmad Chatila in a prepared statement. The deal was modified to quell investors who worried that TerraForm was paying too much in cash for Vivint's 523-megawatt residential solar portfolio. "Since the main concerns with the Vivint deal for SunEdison and TerraForm shareholders were the companies' abilities to come up with the cash, this is a good deal for both," said Tom Konrad, manager of the Green Global Equity Income Portfolio. Mohit Anand, a senior analyst for global markets at GTM Research, agreed. "The move reduces SunEdison's cost of acquiring Vivint, something the market has been very worried about, even though it retains Vivint as a big part of SunEdison's business strategy," he said. SunEdison stockholders will see additional share dilution. But TerraForm's position has improved substantially. "For TerraForm shareholders, it's all good news. The price TerraForm is paying is lower than it was, and it will only pay for operational solar at a fixed price per watt," said Konrad. TerraForm Power's stock was up 24 percent today, and Vivint Solar's stock rose by 15 percent. Not everyone was convinced that the renegotiated Vivint deal was a good thing, however. "Ideally, I think, most investors would be happy to not see the transaction take place," said Angelo Zino, an analyst with S&P Capital IQ, speaking to Reuters. "The fact that we did see a modified version of the terms of the deal...is somewhat positive news." In September, reacting to a precipitous decline in SunEdison's stock price, Ahmad Chatila sent a memo to employees notifying them of restructuring plans. The restructuring included a 15 percent cut to the company's workforce and a narrowed geographic focus.